New Mexico is full of inspirational landscapes, from majestic canyons and winding rivers, to the exotic wildlife and colorful skies. The area provides a dynamic canvas of motivation for any artist. Its roaring culture and vibrant scenery resonate with life. 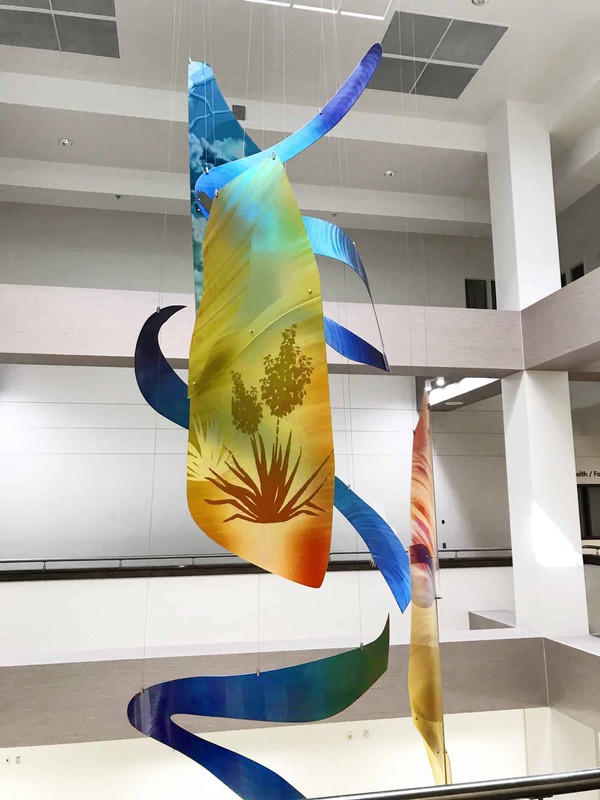 When sculptor and artist Matthew Placzek was asked to create a sculpture for Albuquerque’s Kirtland AFB 377th MDG Clinic, he had more than enough inspiration to draw from. On Matthew’s first trip to Albuquerque to visit the site, he found himself overlooking the Rio Grande from the airplane. It was a breathtaking site which instantly sparked his imagination. 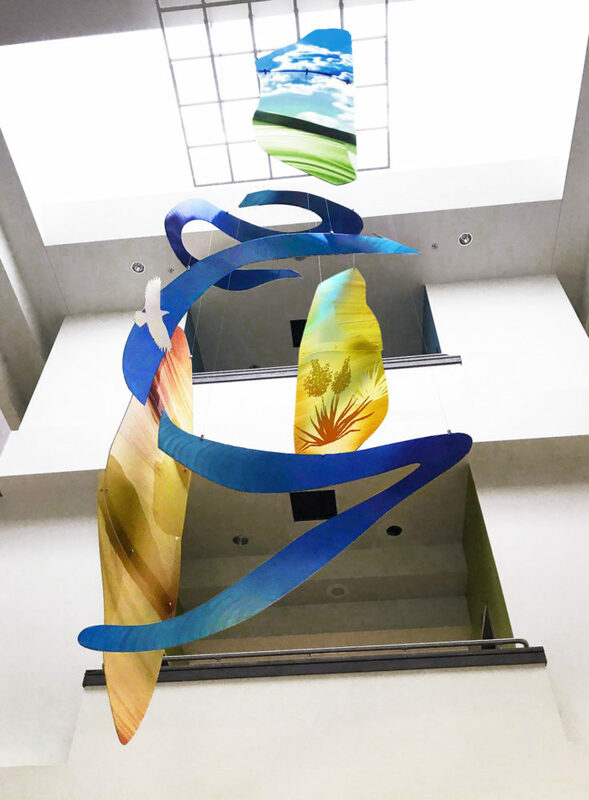 The medical center had an open atrium with natural light cascading down from a skylight. Matthew wanted to work with the natural light and complementing colors to brighten the space while showcasing an impactful piece. 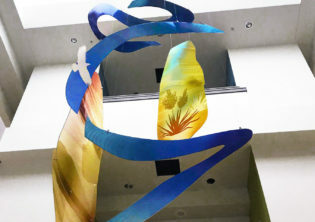 The sculpture began with three colored acrylic panels with depictions of carved canyons, fluffy clouds and Yucca plants. Texture was an important aspect to bring into the panels to create a lasting impression. 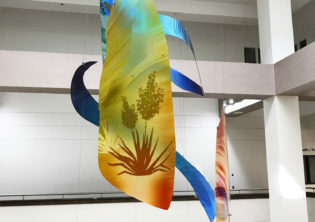 The acrylic panels vary in size ranging from 8 feet tall to 12 feet tall and 3 feet in width. Each panel weighs 40 to 50 lbs. 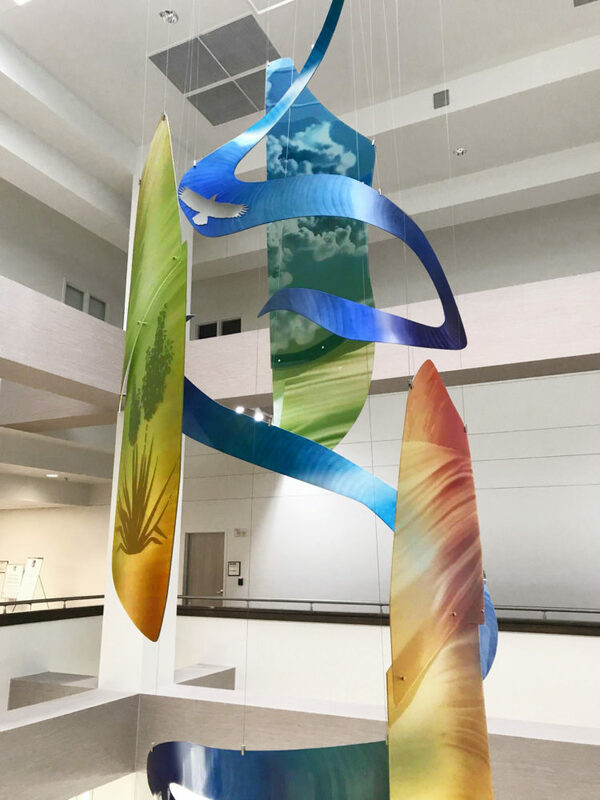 Matthew drew upon the inspiration of the Rio Grande by using aluminum ribbons winding between the panels differentiating in tones of blue, green and indigo. Each aluminum ribbon varies in length from 4 feet long to 8 feet long. Eagles cut from stainless steel and polished to a mirrored finish were added, soaring above and around the river with a 3 foot wingspan. 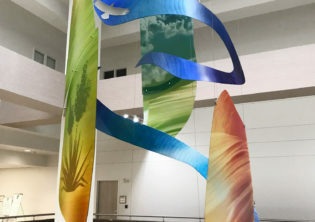 The sculpture is suspended from the ceiling 45 feet in the air and took a team of professionals a total of 22 hours to install. 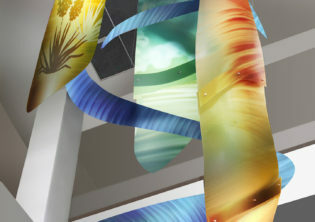 Matthew’s hope for this sculpture is to provide a peaceful, inspiring and joyful environment for the Medical Center. 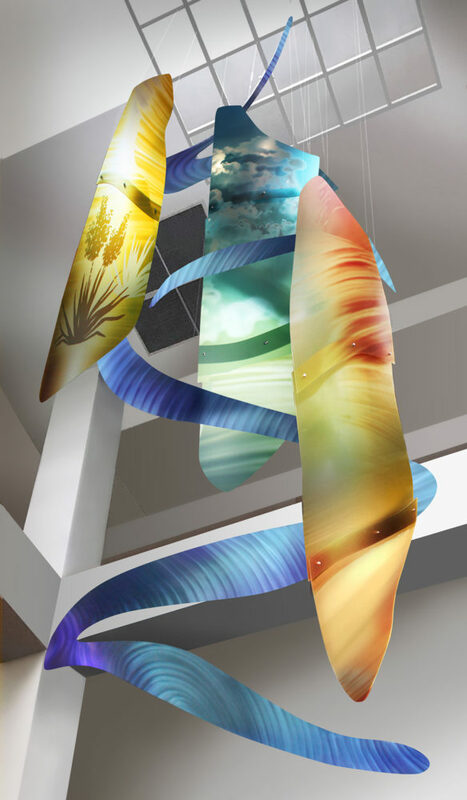 This piece was made for patients, visitors and medical staff to enjoy for many years to come.